Left: Former head of the Independent Police Investigative Directorate Robert McBride. Top-right: Video screenshot of attendees at the Zondo Commission of Inquiry. Bottom-right: Deputy Chief Justice Raymond Zondo. The testimony of former head of the Independent Police Investigative Directorate (IPID) Robert McBride was postponed because the Zondo commission's legal team failed to duly notify the people he implicated. McBride was scheduled to testify on Monday, followed by former KwaZulu-Natal Hawks boss Major General Johan Booysen on Thursday. 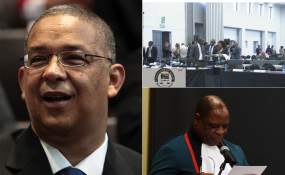 On Monday morning, advocate Paul Pretorius SC, head of the commission's legal team, told inquiry chairperson Deputy Chief Justice Raymond Zondo that the postponement of McBride's testimony is to allow implicated parties to be notified, as stated in the rules of the commission. Pretorius added that there were "logistical challenges, which we needn't deal with in public..."
He also said serious prejudice can be avoided if McBride's testimony is postponed. "That is not acceptable," Zondo said. He referred to a previous incident in February when McBride's evidence had been postponed for the very same reason. He said the legal team failed for more than six weeks to issue notices to implicated persons, adding that those implicated should be treated fairly. "The commission does not have a lot of time... therefore we need to use every hour and every minute we have to do the work and hear witnesses," he said.